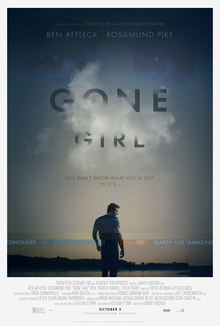 Gone Girl is an intense film that will keep you on the edge of your seat from beginning to end. This is one of those rare yet incredibly unique stories that leaves you reflecting on it long after the end credits roll. After coming home on his fifth wedding anniversary, Nick (Affleck) discovers that his wife Amy (Pike) is missing. The press begins to quickly begin reporting about her disappearance and Nick’s home is investigated. The police find that there were obvious signs of struggle from Amy and also find blood splattered through the house. This then leads to Nick being blamed for killing his wife. As the evidence begins to pile up even more against him, Nick finds himself desperate to convince everyone that he didn’t kill her. The story came from Gillian Flynn’s book of the same name. Considering she also wrote the screenplay, this stays pretty close to the book. It’s a plot that’s difficult to completely discuss considering how many twists and turns it takes us on, but all I can say is that it’s definitely worth watching. I believe that they included all of the important details and vital moments in the film that undoubtedly needed to be included. The story just has a lot of thoughtful and intriguing sides to it, which I can’t help but think about. Rosamund Pike was amazing as Amy. This is another thing about the film that I can’t explain too much without giving anything away, but she is a very commanding actress who seems to truly invest in her characters in the best way possible. I wasn’t a big fan of Ben Affleck in this one. I wouldn’t say he did a bad job, I just think that someone else could have easily played the part. He wasn’t anything overly spectacular or anything, but I believe his acting did shine in several scenes in particular. Although playing pretty much the same role give or take a few minor details, Neil Patrick Harris did a great job portraying Amy’s ex boyfriend Desi. David Fincher did a notable job directing this intense and mesmerizing movie. Personally, I don’t think the movie would have been as eerie and unique with someone else acting as director. Fincher is a director known for his work on intense dramas like this one and it’s not hard to see why. Adding on to this, I just really love that Fincher was unafraid to put his own spin on minor details that most people would totally forget about. The camera shots and how the flashbacks/strange narration structure from the book made an impact on the general mood of the movie. This was one of the few book to movie adaptations that I had few complaints about. I really think this is a one of a kind type story that is worth giving a closer look at. I highly recommend checking this one out while you still have the chance!